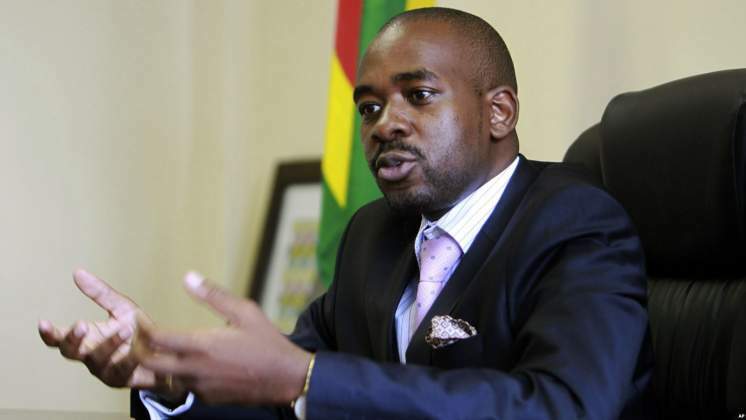 MDC leader Nelson Chamisa has saluted Zimbabweans for the unity and sacrifice they exhibited in reacting to Cyclone Idai that left a trail of destruction in Manicaland Province. Chamisa was speaking after his tour of the affected region on Monday. "I salute the brave ordinary people whose personal sacrifices saved lives. The spirit of ubuntu extended by Zimbabweans from all the corners of the country." He said. The 41-year-old opposition leader called upon Zimbabweans to harness the spirit of Ubuntu that they exhibited during the trying period that the nation is going through. The visit to the Manicaland cyclone-affected areas was more of a listening-interface and interaction with the communities platform. The affected spoke about their ordeals and shared their harrowing experiences. bridge but couldn't make it to Nedziwa, Ngangu, Kopa, Skyline and other areas in Chipinge most affected by this catastrophic disaster as the roads were impassable. I love the people of Manicaland. Chimanimani and Chipinge are great places. I marvel the beauty of our country. We met wonderful people. Though marginalized and tormented, the people have the zeal to better themselves. It really breaks my heart. The most affected places are most likely going to remain inaccessible by road. The humanitarian challenge will remain for some time as the cyclone has destroyed sources of livelihoods, it is important for human assistance to remain active beyond Cyclone Idai news headlines. We have assembled local teams and leadership on the ground aimed at identifying victims that need further help or medical attention and to enable those victims to be transported to a facility capable of giving them the care they need. I salute the brave ordinary people whose personal sacrifices saved lives. The spirit of ubuntu extended by Zimbabweans from all the corners of the country. Diaspora has been unprecedented, exemplary and legendary. The lesson to draw from this is that THE PEOPLE UNITED are best able to respond to any emergency. I urge the nation to harness this ubuntu spirit and to use it to build capacity for responding to similar emergencies in the future. I acknowledge the intervention of various local, provincial, national and international humanitarian organizations that responded swiftly and continue to respond to save and protect lives. The response of the people was better than the response of the State which came like an afterthought when cyclones are a scientific phenomena whose formation and trajectory can be detected and forecast. Saw Cyclone coming but the state did little to warn and remove people from harm's way. With the advent of Climate Change, cyclones have become regular in our part of the world. Citizens would have thought by now the State has learnt something about how to save lives and to protect the people during these deadly cyclones. The sad reality is that the disaster preparedness of the entire infrastructure of the State is itself a disaster. Indeed, the devastation caused by Idai, especially the tragic loss of life, has exposed the clear and present danger that the State itself is a disaster. Most of our road infrastructure and bridges are substandard and of poor workmanship. What we want here is a National Infrastructure Plan for the whole country spanning into 20 to 50 years that speaks to a national focus on roads and rail networks, bridges and bullet trains. Haphazard settlement in the countryside is a ticking time bomb. We need integrated national settlement planning upon accelerated rural upliftment program. Have standards even models for structures and houses certified for human habitation thru a district planning commission. We must put in place effective disaster preparedness and early warning systems to be put in place through a revamp of the current inadequate mechanisms. We need accelerated industrialization and urbanization upon an integrated upgrade of rural facilities to state-of-the-art level in health, energy, communication and housing. We must think and act SMART. Let's do it. We will do it!